Lefty is here to do what he does best… pick the guys who will be in the green vest! He finished with 8 out of 12 picks last week. Read on for his Rd 13 wisdom. 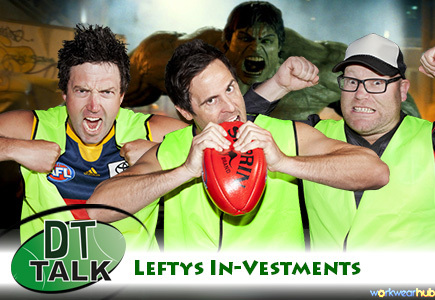 Welcome to Lefty’s In-Vestments for round 13, where once again I will have a crack at picking the dreaded green vests for this weeks games. I was really happy with my effort last week as I picked 5 of the green vesters with my first picks and 3 with my second picks (8/12). Ellis owners would have been happy with his dodge of the green vest and he seems to be safe from the kermit suit…for now. Like every Thursday night I have assessed the team line ups, looked at the previous green vests for each team, and tried to work out the most likely starting sub candidates. Sorry guys no disrespect but I think Swans Subs will be Lamd and Armstrong. sorry marcus no disrespect but i think your incorrect,Lamd is a fictional character. I was thinking of bringing in two mid premos this week but realised I’ll have too many, so was instead looking at Hrovat and one premo.. I really hope he doesnt cop a vest.. but atleast I can drop 2 scores (as long as Thurlow plays). Pittard is also a concern for me as I’ve held him all this time and happy he’s back right when needed most.. however a green vest would spoil that little party! my guesses been ok the last few weeks – maybe starting to get the hang of this caper? ?